Is something known about the Rainmeter (from version 4.2) is no longer with skins, the CPU data (clock, individual cores utilization) and drives (free space, read and write access) queries. Have since tonight suddenly just with this kind of skin problems. If these are also downloaded during the Rainmeter start, or if the folders with the mentioned skins are only (inactive) in the Skin folder, Rainmeter smears me off. Have already updated to the 4.3 beta, but the problem remains. Even a complete uninstall of Rainmeter and reinstall did not fix the problem. Must now always completely remove the CPU and drive skins. Only then does Rainmeter run. This morning, everything was fine with exactly these skins. Can you please post skins that cause the problem or give a link where they can be downloaded? Last edited by rxtd on November 3rd, 2018, 2:03 pm, edited 1 time in total. Unfortunately, I don't have any problems with these skins. I, however, use win10, not win7. I can't resolve the problem if I can't reproduce it. - Corrupted Rainmeter binaries (including plugins). - Something wrong with files in file system. - Something related to Windows. All four do not seem to be plausible in your case if you ask me. Although I'm not a Rainmeter dev, I don't think that it is possible to resolve your issue without more or less complete access to your computer Well, unless some of the devs will also have issues with these skins. It may be possible to find what causes the issue if you post all files on your computed that are related to Rainmeter. Or may be not. I don't know. 1) Rename file to something but .ini. 2) Rename it back and remove all content from skin .ini file. 3) Add part of skin file contents back. And try to launch Rainmeter after every step. If you have crash after 1st step: that's strange, I don't think Rainmeter even scans non-.ini files (and not fonts) in skins folder. 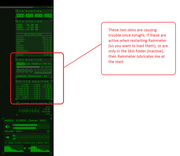 If you have crash after 2nd step: that's strange, Rainmeter should have no problems with blank files. If you have crash after 3rd or 4th step: congrats, you have found a problematic part, now remove it, break it into smaller parts, and repeat step 3. Post results here, maybe I will be able to recognize the problem. P.S. Please, post files here next time you need to share something. File sharing services are very inconvenient. You can just drag file into reply field in the browser. First of all thank you for the informative answer. So I have the advice to create the * .ini file once again and then followed by inserting a code snippet after the other there. Thereafter always Rainmeter always restarted. Except for an error message that the * .in file contains no "meters" and is therefore disabled, nothing happened and Rainmeter ran normally. But no sooner had I inserted the first "meter" in the * ini file (in this case, a simple meter for the background) and I restarted Rainmeter .... ZACK !!! Rainmeter crashed at the restart immediately. That was enough to kill my Rainmeter on reboot. In short, I am finished with my Latin. Especially because this issue only affects my two skins posted here. Everyone else is running wonderfully. And these are much more complicated on the part of the program code than the simple CPU and drives meter. As for the posting of files directly here in the forum, did not know that it works. Therefore, the detour via a Filehoster. Last edited by balala on November 3rd, 2018, 5:11 pm, edited 1 time in total. Reason: Please use code tags when posting code. Youkai1977, I downloaded and installed your package and have no problems with it at all. To be honest, I didn't understand what is the problem with those skins, which are working well for me. From my experience I can say that usually an uninstall and reinstall of Rainmeter doesn't help. Never does in my opinion. So, could you please give us a few details about the problem caused by those skins? Wow. I have no idea what can cause this. By the way, if all other skins work well, did you try to just rename skin or move it to another folder? If the existence of the skin itself causes crash but only for certain skins then maybe if it will be some other skin with the same content everything will work? Thanks @all for your answers. - 1: I used to load older CPU and Drives * .ini, from older skins that I still had. Curiously, then exactly the same error occurred. Rainmeter smeared me off. - 3: A two-month old backup of my Windows played back and as it seems so far (sometimes fast knock on wood) run the two meters (CPU & Drives) again. Have these inserted into Rainmeter after the backup play back and Rainmeter started, stopped, started and so on. Only now can I first update my system. The backup was a little bit old. But no matter, as long as my Rainmeter runs clean again. In this sense, thank you again for your effort. But I consider the topic (insofar as it now continues to run) first as solved. I'd like to jump into this issue, just registered to report the same trouble. yesterda i actualized Win10 from very buggy retired OLD 1809 to 1903 fast ring and Rainmeter crashes on startup. so i did a clean uninstall and wiped all folders and registry, then installed the latest Beta 4.3**** again and skin by skin, the skin who makes Rainmeter crash is ELEGANCE 2, this is a nice TIME and Date Skin i love to use...so then i figured out that ALL Time and Date RELATED skins make Rainmeter also crash again. I'm not sure whether the creation Date has to do something with this, they are from 2011 if i am not reading it wrong...but yesterday with the buggy 1809 everything worked fine..